My struggle began a few weeks ago when we introduced our Reindeer and Donkeys sermon series at Access. In reading the scriptures I realized that the Bible never says Mary rode a donkey. That tradition goes back to a book written in the 3rd century. Also, there were no wise men at the manger. The Bible says they came later. With that knowledge in hand I set out to perfect my rubber duckie nativity. 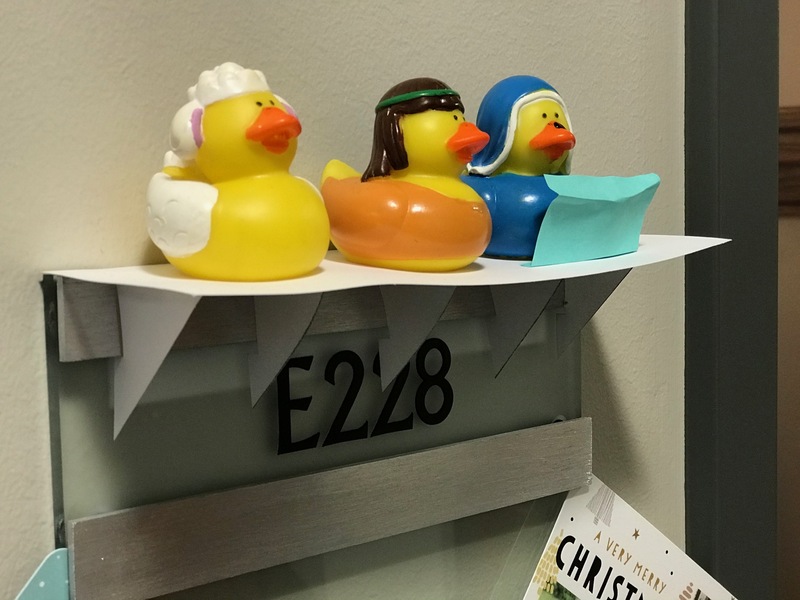 First, I went to a co-worker whose desk near mine – to the east of course - and asked permission to put my wise men ducks there, looking in the general direction of the Mary and Joseph duckies. We have great plans for the wise ducks to join up sometime in January. A few days later, though, another co-worker commented that the Mary duck already had a baby Jesus duck, and that seemed, well, premature. So now the Mary duck has a color-coordinated blue Post-It note hiding the baby Jesus duck until Christmas. Apart from everyone being rubber ducks, my nativity has reached historically accurate perfection. Maybe. There's bound to be some other detail I've missed that will make it fall short of perfection. Two thousand years ago, the original nativity seemed to fall well short of perfection too. First there was the census that drove Mary and Joseph to Bethlehem in the final days of her pregnancy. Then there was the whole inn debacle. The wise men recognized a king had been born, but they showed up late. At least the shepherds showed up in the right place at the right time. I realized, though, as I recalled the original Christmas story that none of those imperfections mattered. God embraced them and worked in the midst of them. The only detail that truly mattered was that the perfect God had come into the world, choosing to join us in the midst of imperfection. What God sought then and still seeks today is not perfection but relationship. Christmas is three days away. Take a deep breath. Breathe in the awareness that Christmas is about God wanting to relate to you. Breathe out the stress of trying perfectly to prepare, because God chose and chooses to come to us in the midst of imperfection. P.S. – Bring family and friends and celebrate the birth of Christ with us on Christmas Eve! Access will worship at 11:00 a.m. and 5:00 p.m. You can find a full list of FUMCR Christmas Eve services at www.fumcr.com/advent#eve.